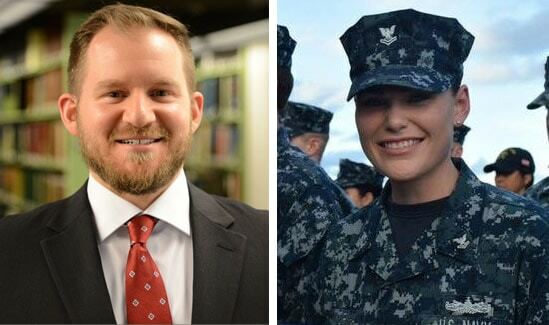 An article from Law.com features comments from Washington and Lee University law students Lauren Morina ’20L and Michael Stinnett-Kassoff ’19L about the path from military service to law school. The article focuses on the non-profit program Service to School, an organization that helps veterans parlay their military service to gain entry into the nation’s top law schools and other higher-education institutions. Stinnett-Kassoff and fellow second-year law student David Thompson serve as co-directors of the law admissions program for Service to School. “Most of us are automatically leaders from being in the military. That definitely translates into the classroom. We’re also used to helping each other out,” said Stinnett-Kassoff in the article. Prior to law school, he spent eight years in the U.S. Navy, including two deployments to the Persian Gulf and another off of Japan’s coast. Morina spent four years in the U.S. Navy as a cryptologic intelligence analyst, deploying twice to the Horn of Africa, and a third time in the Baltic region. In the article, she says that her choice of W&L Law was directly related to the values she learned in the military. “There’s more emphasis on closer relationships with classmates and professors, and it was something I was very familiar with from my military service. Working in teams, you become close to people surrounding you, and there’s benefits of that when going through something challenging and difficult,” she told Law.com.